The meeting also included what turned out to be extended time for public comments. DEQ and Oregon Health Authority are cooperating on rule development. DEQ bears most of the leadership and implementation responsibility, so these notes will refer generally to DEQ, but recognize that OHA is involved as well. that your facility’s risk levels are below the applicable RALs you won’t have to make any adjustments. You may, however, have to comply with some additional requirements that are discussed below. As others have commented, the proposed RALs are very stringent. In fact they would be the most stringent of any of the western states and much more restrictive than most of the California and Washington levels. Ambient monitoring may be used to supplement risk compliance demonstrations, but it may not be used in lieu of dispersion modeling or modeling-based analyses. New facilities and modifications seeking an air quality construction permit after the rule becomes effective (probably late summer or early fall of 2018) will have to comply with the rules immediately. The draft rules will be implemented in two phases for existing facilities. In the first phase, DEQ will quantify health risk from each permitted facility in the state and will designate the highest-ranked 80 facilities, “Tier 1” facilities, as being subject to the rule. While not explicit in the draft rule, DEQ stated their intention to apply the rule to the selected 80 facilities in blocks of 20 facilities per year over four years. The highest-ranked 20 facilities will be required to comply in the first year, the 20 next-highest-ranked facilities will become subject the following year, and so on. Existing facilities will be ranked for implementation purposes based on each facility’s estimated health risk potential (accounting for roughly 75 percent of the ranking score) and the population density and demographic makeup surrounding it. Health risk potential will be calculated as a function of the specific toxic compounds the facilities will emit and the rates at which they will be emitted. The demographic factor will be composed of percentile values for the following characteristics of the population within 1 km of the facility: percentage of minorities, percentage of low-income individuals, and percentage of children under five years old. The population within the 1 km radius will also be converted to a percentile value and included in the calculation of the demographic factor. If your existing facility is not identified as one of the 80 Tier 1 sources, you will have at least a five-year reprieve from having to assess your facility’s risk and potentially comply with risk limits. 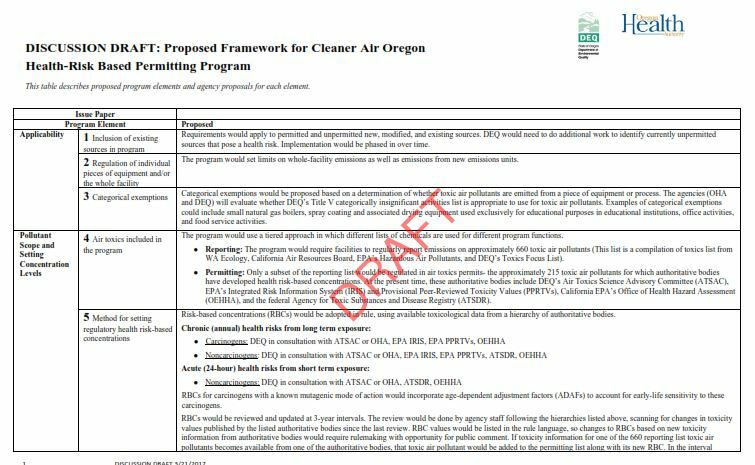 After that period, DEQ “may fully implement the Cleaner Air Oregon rules.” But you won’t automatically have to comply after the five-year Tier 1 phase. DEQ will continue to control the pace of implementation because facility-level applicability will be triggered by a written notification from DEQ requiring an assessment of your risk levels. The draft rules don’t commit DEQ to a Tier 2 implementation schedule. Once notified, you will have from 30 to 270 days to respond, depending on the method you choose to follow to evaluate risk. If or when you are required to evaluate the risk levels posed by your existing facility’s toxic air emissions, you will be required to do the following depending on the results of your analysis (refer to Table 1 below for a summary). Risk is below de minimis levels – Submit a Risk Assessment Notification to DEQ. Risk is below the RALs – Apply for an Air Toxics Permit Attachment (ATPA). Risk is above one or both RALs, but the source will be able to comply based on changes or limits when the ATPA is issued – Apply for an ATPA that includes a condition or conditions that will reduce the source’s risk levels below the RALs. Risk is above one or both RALs, but the source will be able to comply based on changes or limits that will require “a reasonable, specified period of time” to implement – Apply for an ATPA with appropriate conditions and prepare and submit a Risk Reduction Plan. The plan must achieve acceptable risk levels within two years with the possibility of extensions. A Risk Reduction Plan comes with an extensive set of requirements that are laid out in Rule -0220. Evaluate the facility’s risk levels using a “Comprehensive Health Risk Assessment” (CHRA). Performing such an assessment is potentially beneficial because it provides wide scope to evaluate and interpret highly case-specific data and conditions. Accordingly, it is the least conservative of the optional evaluation methods. On the other hand, it requires the most specialized expertise, likely requires significantly more time and money to conduct, and requires the highest level of Department coordination and discretion. It also produces the greatest potential for others to dispute the data and interpretations used in the analysis. Identify and apply Best Available Control Technology for Toxics (TBACT) on all non-exempt toxics emitting units (TEUs). Periodically review and report on TBACT updates and install updated TBACT. The draft rules propose, for existing sources, Conditional Risk Level thresholds above which Department Director approval is mandated. Risk is above one or both RALs, the source is not fully using TBACT, but you’ve determined that full TBACT will not reduce risk below the RALs – Apply for an ATPA that includes a Conditional Risk Level and submit a Risk Reduction Plan that will lead to full TBACT implementation. Risk is above one or both RALs, and the company can demonstrate a financial inability to reduce risk to acceptable levels – Apply for an ATPA that includes a Conditional Risk Level with postponement of risk reduction [Section 0230(4)]. DEQ will evaluate the request taking into account several factors including the company’s financial status based on records confidentially submitted, technical alternatives and options for partially reducing emissions, the number of people employed by the company, the level of risk posed, and the nature of the exposed population. DEQ’s determination must be made at the director level and may include conditions including periodic review of the need for and acceptability of postponement. All TEUs at a source are exempt Currently, as-is Submit a Risk Assessment Notification. With currently achievable limits and conditions Submit an ATPA application with request for conditions and/or limits. With near-term reductions Submit an ATPA application and a Risk Reduction Plan. Above RALs, below Director Consultation RALs Currently using TBACT Conduct a Comprehensive Health Risk Assessment. Submit an ATPA application with a proposed Conditional Risk Level(s). Not fully using TBACT Conduct a Comprehensive Health Risk Assessment. Submit an ATPA application with a proposed Conditional Risk Level(s) and a Risk Reduction Plan. Financially unable to implement TBACT Submit an ATPA application with a proposed Conditional Risk Level(s) and a request for postponement of risk reduction. DEQ could require specific facilities to achieve risk levels below the applicable RALs in cases where they’ve identified an area where an Area Multi-Source Risk Action Level is being exceeded. These instances should be quite rare if for no other reason than anticipated ongoing agency resource constraints. If you’re an existing facility and you wish to add a new TEU or modify an existing one, you will only have to comply with the toxics rules if you have already been required to perform a risk assessment (i.e., when DEQ gets around to sending you a notification after the Tier 2 implementation phase has begun). The discussion draft rules allow DEQ to request an inventory of toxic air pollutant emissions as they did late last year for all permitting facilities. This authority extends to unpermitted as well as permitted sources. They are also requiring themselves to request updated inventories on a statewide level at least every three years. You need not have been triggered into the rule by a notification for the inventory requirements to apply. These discussion draft rules will certainly change to some extent before being published for formal public review and comment as draft rules. DEQ has not resolved one critically important issue: whether to calculate a source’s risk levels using its actual or potential emission rates. The rules are clearly designed to work with potential emissions. If DEQ were to switch to an actual emissions paradigm, the rules would have to be modified substantially. DEQ currently plans to revise the discussion draft rules and publish proposed rules for public review by October 13th. Comments would be accepted through December 15th, and DEQ plans to submit final rules to the Environmental Quality Commission during its June 2018 meeting. We may discuss the risk analysis mechanics in a separate post. In the meantime, please call us if you would like help understanding them. The draft rule says DEQ will use a Level 1 risk analysis procedure to rank facilities. Level 1 relies on a table of dispersion factors that DEQ developed based on conservative modeling analyses. The dispersion factors convert pollutant emission rates to ambient concentration values. A case-specific dispersion factor is selected by intersecting the nearest receptor distance column and the emission source’s stack height row. If one or neither of these parameters is known, the smallest provided values are supposed to be used, resulting in the smallest and most conservative dispersion factor and highest risk estimate. Because DEQ won’t have stack heights and receptor distances for most sources—and won’t have time or resources necessary to get the data—I presume they will simply use the most conservative default factor for all sources.